[142 Pages Report] PTFE Fabric Market was valued at USD 654.7 million in 2017 and is projected to reach USD 908.1 million by 2023, at a CAGR of 5.6% from 2018 to 2023. For company profiles, 2017 has been considered as the base year. In certain cases, wherein information is unavailable for the base year, the years prior to it have been considered. 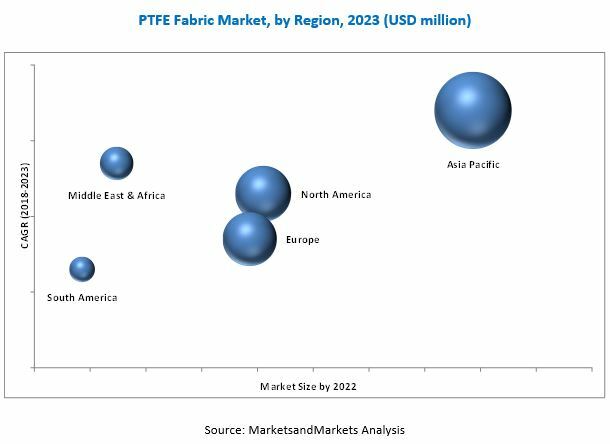 The research methodology used to estimate and forecast the size of the PTFE fabric market begins with capturing data from the revenues of key vendors. This data has been obtained from various secondary sources, such as Hoovers, Bloomberg, Factiva, and various other government and private websites. 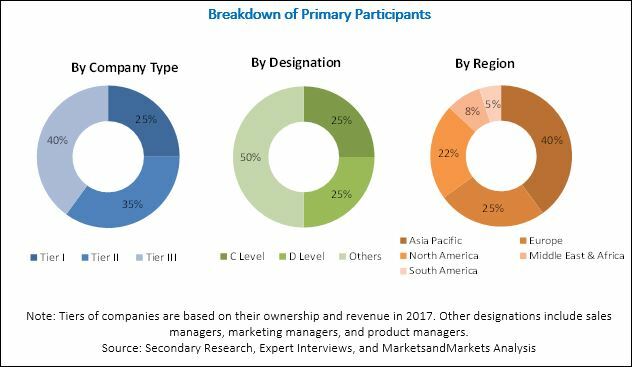 The offerings of vendors have been taken into consideration to determine the segmentation of the PTFE fabric market. After arriving at the overall market size, the PTFE market has been split into several segments and subsegments, which have been later verified through primary research by conducting extensive interviews with key personnel such as chief executive officers, vice presidents, directors, and executives of leading companies operating in the PTFE fabric market. Data triangulation and market breakdown procedures have been employed to complete the overall market engineering process and arrive at the exact statistics for all segments and subsegments of the PTFE fabric market. The breakdown of profiles of primaries has been depicted in the figure below. The PTFE fabric market has a diversified ecosystem of upstream players, which include raw material suppliers, and downstream stakeholders, vendors of PTFE fabric, end users, and government organizations. Taconic (US), FIBERFLON (Turkey), Saint-Gobain Performance Plastics (France), W. L. Gore & Associates, Inc. (US), Chukoh Chemical Industries (Japan), Daikin Industries (Japan), Sefar AG (Switzerland), Fothergill Group (UK), Birdair (US), W.F. Lake Corp. (US), Aetna Plastics Corporation (US), CENO Tec GmbH (Germany), and Techbelt (UK) are some of the leading players operating in the PTFE fabric market. Scope of the Report: This research report categorizes the PTFE fabric market based on type, end-use industry, and region. It forecasts revenues as well as analyzes trends in each of the following submarkets. The PTFE fabric market is projected to grow from USD 690.8 million in 2018 to USD 908.1 million by 2023, at a CAGR of 5.6% from 2018 to 2023. High demand for PTFE fabrics in the automotive industry, their growing consumption in the construction industry, and increasing consumption of composite fabrics for industrial applications are the key factors driving the growth of the PTFE fabric market across the globe. The nonwoven fabric segment is expected to be the largest type segment of the PTFE fabric market during the forecast period. PTFE-based nonwoven fabrics are extensively used in composites manufacturing. They are also used as a component in the apparel, healthcare, and industrial applications, thus keeping the demand for this segment high. By end-use industry, the food segment is expected to lead the PTFE fabric market from 2018 to 2023. This segment is also projected to grow at the highest CAGR during the forecast period. Anti-friction and non-flammability are the key advantages of PTFE fabric, and with PTFE being an FDA-approved, there is a growing demand for this fabric in the food segment. The Asia Pacific region is the largest and the fastest-growing market for PTFE fabric across the globe. The Asia Pacific PTFE fabric market is majorly driven by the growing demand from end-use industries, such as food, construction, and filtration. The growth of these end-use industries is largely driven by the region’s growing population, increasing per capita income, and changing lifestyle. Rising demand across the globe has led to capacity expansions by the manufacturers of PTFE fabric. The high cost of PTFE coated fabrics in comparison to PVC coated fabrics is the key factor restricting the growth of the market. Taconic (US), FIBERFLON (Turkey), Saint-Gobain Performance Plastics (France), W. L. Gore & Associates, Inc. (US), Chukoh Chemical Industries (Japan), Daikin Industries (Japan), Sefar AG (Switzerland), Fothergill Group (UK), Birdair (US), W.F. Lake Corp. (US), Aetna Plastics Corporation (US), CENO Tec GmbH (Germany), and Techbelt (UK) are the leading players operating in the PTFE fabric market. These companies have adopted various strategies, such as expansion, acquisition, new product launch, contract, and consolidation to increase their market presence and to meet the growing demand for PTFE fabrics. 10.4 W. L. Gore & Associates, Inc.
10.11.6 Zhejiang Kertice Hi-Tech Fluor-Material Co., Ltd.
10.11.10 Asahi Glass Co., Ltd.